It’s funny to see people in new relationships. They do everything together. Things like grocery shopping or cooking dinner or laundry at the laundromat or working out. They hold hands everywhere they go and kiss on the bus or cuddle while waiting on the corner for the signal to change or play Scrabble in the park. Yes, I love seeing young couples in love. They remind me of Hubby and myself back when we were young and foolishly in love. One of the things we used to do together was cook. We were both pretty inexperienced in the kitchen, but we enjoyed trying out new recipes. I remember the first cookbook we bought together, The Complete Hot & Spicy Cookbook. Guess how long ago that was? Twelve years! As far as cookbooks go, Hot & Spicy is pretty good. It’s one of those compilation cookbooks with recipes from several different cuisines. The Indian recipes were our favorites and we learned a lot about Indian food, mostly through trial and error. For instance, did you know that feta cheese is not a suitable substitute for paneer.? We didn’t, until we tried to fry it. And did you know there are two kinds of mustard oil? One is used as a moisturizer and the other for cooking. The food grade oil is nearly impossible to find, but we didn’t know that until we had used half a bottle of the body oil. (Note to self: if labels are written in a foreign language, ask for help translating!) And speaking of body oil, did you know that ghee can also be used as a moisturizer? If you don’t mind smelling like buttered popcorn. I haven’t touched Hot & Spicy in a while, but since Regional Recipes is going to India, I thought it would be a hoot to revisit the first Indian dish we ever made together (fried egg curry) out of the first cookbook we ever purchased together. Sweet, huh? You thought I was all logic and practicality, but I do have a sentimental, romantic side! I should mention that we weren’t really impressed with the results the first time around, and we thought it was just a bad recipe because we followed the recipe to the T (including hand chopping 3 onion into a paste and frying 8 eggs to split between the two of us!). In retrospect, it was a perfectly good recipe but we were just too inexperienced to work with it. This time around, it turned out great. It really helps that I now own a food processor and we halved the recipe. Also added the tomatoes for a little more depth. It definitely won’t take 12 years for me to make this again. More like 12 hours. That's how much we liked it. Using a food processor, make a paste with the ginger, onion, garlic, chilies and vinegar. In a small frying pan, heat about 2 to 3 tbs oil with the cardamom, cinnamon and bay leaves. When the oil is hot, add the paste and fry until the oil looks like it’s separating back out from the paste, probably 8 to 10 minutes. Be sure to control the heat, because if it’s too high, the paste will burn. Add in the tumeric, chili powder, and sugar and continue to fry for about another minute. Finally, add in the tomatoes and cook a bit longer (until they soften, if using fresh ones). If the mixture gets too dry, add a little water. Season with salt and remove from heat, but keep warm. In another frying pan, heat up a little oil to fry the eggs. I just fried them all at once and spooned the curry mixture over the eggs as they were cooking. This method leaves the yolks creamy while the whites cook. Alternatively, you could cook the eggs one at a time and remove them to a plate. Once they are all fried, put the curry mixture back over low heat and carefully turn the eggs in it. This is the method given in the book, but I’m too scared to break the yolks or overcook them this way. Garnish with chopped cilantro (something I forgot to do) and serve with naan. Be sure to break the yolks, mix everything around and use the naan to sop it all up! This is my submission to Regional Recipes, the blogging event that takes us around the world to spotlight different regional cuisines. This time we're in India and I'm hosting. The deadline is officially Feb 15th, but if you're really nice, I'll take submissions up until the 20th, which is when the round-up goes up. Haven't tried a fried egg curry before, but I did see Madhur Jeffrey (Jaffrey?) doing one on some show. Yours look delicious! js, well, I guess because I like you guys, it's okay if you're a little late :-) But seriously, no worries! I'm anxiously waiting to see what you'll be making. Marinating is not a method i see often in Indian cooking. Manggy, I didn't realize you'd be away from home for so long! I should be paying more attention. And it's so cliche to say it, but it will come when you least expect it. I swore I'd never get married, but then I was the first in my circle of friends to "go domestic", as they say. 8 eggs? Mustard body oil? No wonder that recipe didn't work. Haha. I have some old Indian recipes in the queue, but am trying to muster up the energy to be more creative. We'll see how that goes. I hope you can muster up the energy! I miss your postings. wow looks really delicious! I like the idea of serving it with eggs! The runny yolk and curry sounds like an awesome combination. oh yeah, girl. i've really started loving eggs with anything savory on top - like the baked eggs in meat sauce, in spinach, in spicy sauce, etc. but i REALLY love what you've done here. pigpigscorner, the flavors are wonderful, but it's the textures that really count here. The creamy yolks with the "sauce" is spot on. Chopping the onions and herbs by hand are no match for the food processor, at least in my experience. 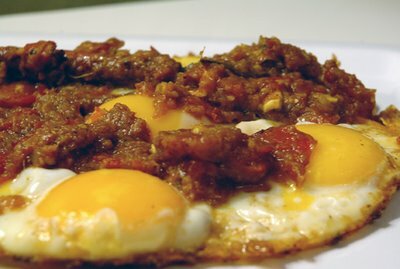 we are never full, if you like this type of combo, you may also like this spicy merguez and egg skillet. Very similar concept, but saucier and with lamb sausage. Can't go wrong with that! Paula, I do hope you like this! We really enjoyed it. The key is to cook the onion paste sufficiently, so it doesn't taste raw. Good luck and let me know what you think. This looks so good! I may have to try another Indian dish! Follow up comment! I just finished eating this for dinner! YUMMY, YUM, YUM! That cardamon really comes through, as does the heat from the chili. It reminded me of an Italian dish I've eaten my whole life of eggs poached in a tomato mixture. Obviously the seasonings are much different, but I love them both. This was great; thanks for posting it! YUM! PS: Enjoyed reading your memories of the first time you made this. Happy Valentines Day to you and your guy! I am so on that recipe. Isn't the cooking learning curve always interesting? Also I'll try to be really nice so I can get a recipe into your regional recipes his month. By the 16th I promise! Paula, yay! So glad you like it! And happy Valentine's Day to you too! Make your guy do something extra special for you. y's making me breakfast in bed. bb, you're nice, so I'll give you until the 20th :-) I'll be anxiously waiting to see what you cook up. When I think back to when I first started cooking, I can only chuckle. I still have some pretty sad blunders, but at least they happen less often. What a nice post to read on V-Day. Hope yours is a good one! These curried fried eggs sound really good!